An Audi executive said Monday that industry watchers agree four megatrends will affect automotive space: connected cars, shared mobility, autonomy and electrification. 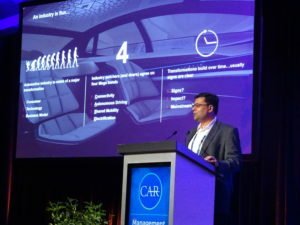 But connected vehicles and data director Anupam “Pom” Malhotra told the Center for Automotive Research Management Briefing Seminars that Audi felt the four trends would roll out in a different order than the current discussion forecast. These four trends and the order of their appearance matter for collision repairers as well. Connected cars allow the vehicle to alert an insurer, OEM, fleet operator — or potentially even a body shop — they’ve been in a crash. Such vehicles could communicate with traffic lights, other vehicles, and even pedestrians carrying a cellphone to avoid crashes in the first place. They also can alert the driver to take a vehicle to a mechanic or that work was done incorrectly (i.e. a DTC) by one. Full electrification is thought to require less service and maintenance. Both it and partial electification (a plug-in hybrid or a traditional hybrid) can make for more dangerous or simply more complex (for example, heat sensitivity) vehicles to work on by a repairer. Complete electrification might require the OEM to lightweight more of the vehicle to offset the heavy battery, creating new repair complexity in the form of mixed materials. Shared vehicles in the form of a Lyft or Uber might not affect repairers as much — they’re still owned and driven by a traditional motorist. Even a model where an employee’s autonomous vehicle can drive around ferrying folks while they’re at work still involves a privately-owned vehicle. However, shared vehicles in the sense of OEM or even private fleet subscription services could be more disruptive if the true vehicle owner picks where a car gets fixed after a wreck and which parts are used on it — as opposed to a lease, where the lessee makes those calls. Also, as Malhotra noted, shared mobility for now has expanded miles driven, which is an indicator of crash frequency. One of Malhotra’s slides estimated automated cars classified by SAE as Level 5 — all roads, all weather, no supervision — were at least 10-15 years from market. But Level 4 autonomy — the car able to drive itself under certain conditions in a geofenced area — has appeared or is about to do so. If Americans ultimately ditch one or both of their 1.96 vehicles in favor of fleet-controlled autonomous vehicles, that seriously affects repair volume unless you have a deal with the fleet. Volume is also affected if the vehicles avoid accidents that humans would have caused. He also cited research by the Boston Consulting Group predicting that 25 percent of miles driven in 2030 would be in a shared, autonomous and electric vehicle. “The shift to SAEVs, which would be gradual and would begin by the early 2020s, would likely occur in cities with more than 1 million people, where there is sufficient demand to keep fleet utilization high and there are significant pain points associated with private vehicle ownership (expensive insurance, difficulty finding parking, and congestion),” Boston Consulting wrote in 2017. Connectivity was “already mainstream,” Malhotra said. 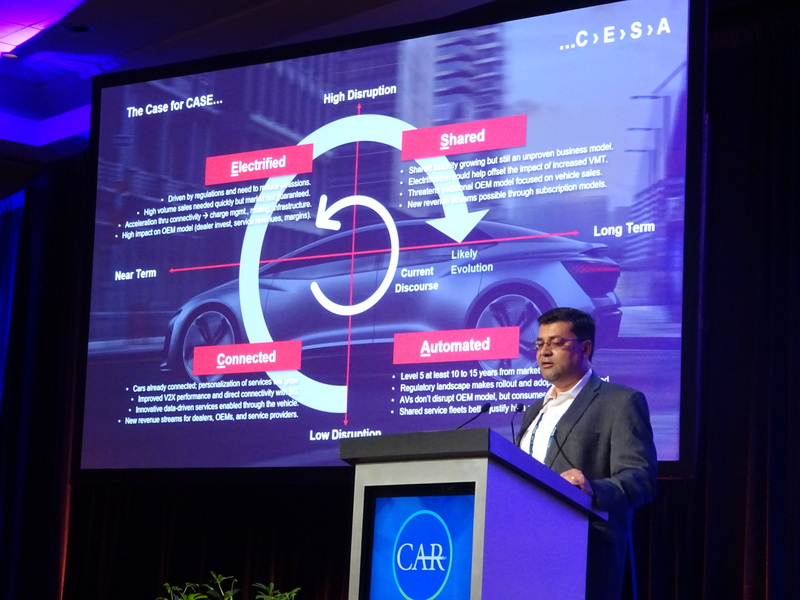 He predicted more personalized services and new “data-driven services” from the vehicle would be trends, and the connectivity opened up new revenue options for automakers, dealerships and the aftermarket. Malhotra also predicted vehicle-to-everything (“V2X”) performance would grow and latency would fall (making for quicker safety-related responses) with a shift to 5G networks. In an interview after the presentation, Malhotra said Audi would probably support connectivity in both this fashion and the older direct short range communications (“DSRC”) format, which he implied might be selected by city planners, unless few areas wound up using DSRC. Regulations drove the push and speed of electrification, for the actual market demand “is short of where the targets will need to be,” Malhotra said. Nevertheless, “it is a near-term scenario,” he said. OEMs have largely solved the battery range issue on completely electric vehicles. But ease of ownership isn’t necessarily settled. “That’s been an issue,” Malhotra said. He recalled hearing last year that the electrical infrastructure was like the gas infrastructure of the 1920s. However, about 80-90 percent of charging is expected to occur while the car’s at home or parked at the owner’s workplace, Malhotra said. All that was really needed was a solution for the other 10 percent — meaning that electrical infrastructure didn’t need to be as widespread as gas stations today. Connectivity also made electrification more convenient, with algorithms creating a “better routing experience” to ensure charge station proximity and stations able to communicate if they’ve got an empty spot to charge up. Shared vehicles increase miles driven, but making those vehicles electric softens that blow, he said. (Less fuel and maintenance costs.) However, he argued that there was no profitable business model yet at this point. Still, shared vehicles are a high disrupter to the auto industry, as they change how Americans access transportation. It changes the retail landscape, as Americans don’t have to own a car. Right now, Uber and Lyft are only displacing the taxi and rental industry, he said. However, they’re also demonstrating a level of convenience and comfort customers didn’t realize was possible, according to Malhotra. This meant shared vehicles had to be part of the “solution set” of “transport models of the future,” he said. “Shared is a high-disruption scenario, cause it does change the automotive business model in a pretty big way,” he said. But it’s a longer-term issue, since right now it’s only affecting the taxi and rental industry. Finally, autonomy would be a long-term trend — but potentially be less disruptive to the auto industry than one might think, according to Malhotra. Autonomous capabilities are “sellable features,” and could be marketed to a consumer like any differentiator, he said. The regulatory landscape and a lack of customer confidence could curtail the spread of autonomy, as could the price of the technology, according to Malhotra. However, deploying a fleet of autonomous vehicles with the ability to turn that feature on or off would solve the cost issue, he said. Connectivity, electrification and shared vehicles would all help mainstream automation, he said.